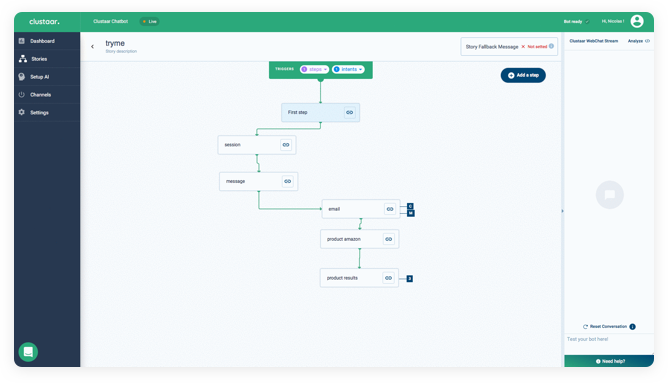 The default integration for Clustaar chatbots: Create your chatbot, configure your web chat and integrate it on any website with a single line of code. Clustaar’s web chat allows you to connect your chatbot to any website. Your bot provides a seamless 24/7 customer experience for your visitors and users. Customize it: Make the bot your own and customize your bot with your company colors and logo. This customized chat widget will work in harmony with your web page enhancing the experience for the end user. Behavior Configuration: helps answer user questions before they ask. Typically, the first time users visit your website, the bot will welcome customers. With this feature, the conversation continues and allows the bot to ask questions or provide prompts based on page visits. As users navigate the website the conversation changes with the new event triggered and or URL loaded. If your customers are visiting your pricing page, the bot can appear with additional information on pricing or set up a demo. Send Event: Let the bot answer user questions before they ask with the ‘Send Event’ feature. With this feature, the bot can ask questions or provide prompts based on page visits. As users navigate the website the conversation changes with the new event triggered and or URL loaded (i.e- when customers are visiting your pricing page, the bot can appear with additional information on pricing or set up a demo). Advanced FAQ: The chatbot answers recurring questions on your website. You can use it to replace or complement existing FAQ and contact pages. The natural language understanding capabilities are much more efficient than a typical FAQ search field. Scenarios can be adapted to the context of the user (language, a page of the website). You can qualify the visitor on your website and capture specific information (email, contact details). A human agent can take over the conversation, if needed, and follow up by email. Software support: In a context where users are logged into your application or software, you can provide advanced support, ask qualifying questions to know where to direct the user, and create support tickets. Yes, Clustaar Webchat is mobile-friendly. It can be deployed on any website or web-based application. Can I use Clustaar Webchat for a WordPress site? This is similar to including a Google Analytics tag. How much does the Webchat plugin cost? The Clustaar Webchat Plugin is included in the normal pricing. The latest version of the most common browsers is supported: Chrome, Safari, Firefox, and Microsoft Edge. It will work with most versions of Internet Explorer, although you might see some issues depending on the version you are using. Can I deploy Clustaar Webchat on an intranet or private web app? Can I deploy the Clustaar Webchat inside a native app (Android or iOS)?